“Somalia joins Al-Shabab” is a statement doing its rounds by sports, especially football fanatics on twitter rather in a lighter sense and not in the terrorist connotation, an example of how powerful Professional African Language Translation determines the effectiveness of communication. 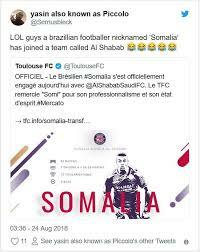 In this sense Somalia is a professional Brazilian football player who was formerly with the Toulouse FC team in France but recently transferred to Al-Shabab in Riyadh, Saudi Arabia. A tweet by a bemused football fan about Somalia joining Al-Shabab football club in Saudi Arabia. However, one cannot miss out the elephant in the room as he shares a name with Somalia, a country in the horn of Africa that has for a decade battled with the Al-Shabad; a terrorist group linked to the notorious Al-Qaida in Afghanistan. This group has in the past carried out deadly attacks not only in Somalia but also in her neighbouring countries like Kenya and Uganda as a result of the latter sending their troops under the African Union for peace keeping purposes. The attacks included the 2013 West Gate shopping mall attack that killed 70 people and the 2015 attack on a Garissa University College that claimed 178 people and injuring scores in Kenya. Then there was the 2010 attack on Uganda on scores of football fans that had gathered to watch the FIFA World cup finals in Kampala. All the above points us to a major factor involved in communication and that is the way a message, service or product is received by the intended audience or market. This further sheds light on the fact that same names or words do not necessarily refer to the same thing. In Africa alone there are over 1500 indigenous languages and although some share words and pronunciation of those words, it does not necessarily mean that the meaning of those words, names and phrases is the same. And while many African countries share languages; there are changes in those languages to suit a particular country, region or tribe. This can be as a result of different cultures, border lines, foreign influence and the accent borrowed from their mother tongues. Swahili; Spoken by over 30 million natively but as a second language by 135 million people in countries like Kenya, Tanzania, Congo, Rwanda, Burundi, Uganda, Mozambique. It should be noted that the Swahili in Kenya has a heavy English influence and is therefore more urban and at times referred to as Sheng. Bemba and Luganda; the former is for Zambia and the latter is for Uganda but both language sound so similar when being spoken although there is hardly any mutual understanding. Accuracy which is achieved by use of qualified translators who are native speakers of the languages in question. This is because they do their work putting cultural phrases, region’s grammar and mannerisms of the people who speak that language into consideration. Specialization falls under accuracy too because if the service to be put out there is financial, then a translator qualified in that line should be used. For example, for an audience in Mozambique, it would be best to use a translator well versed with the Portuguese there other than one speaking the Angolan Portuguese. Confidentiality is key especially when it comes to business issues. One should hire an African language translation company that highly regards keeping the client’s information and ideas safe from competitors. This can be achieved through signing confidentiality agreements.